Question 1 What are ions? Question 2 How an ion is formed? Question 3 How a cation is formed.Give example? Question 4 How an anion is formed.Give example? Question 5 What are simple ions.Give example? Question 6 What are complex ions.Give example? Question 7 What are ionic compounds? Question 8 Define formula unit of an ionic compound? Question 9 Calculate the formula mass of calcium chloride and sodium carbonate? An atom contains electrons,protons and neutrons. Electron has 1 unit negative charge. Proton has 1 unit positive charge. Atom contains an equal number of negative and positive charge which make it stable. 1)If an atom has less electrons than normal,then it gets positive charge. 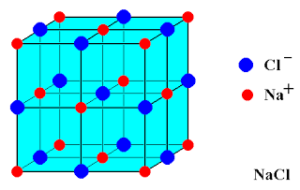 2)If an atom has more electrons than normal,then it gets negative charge. An ion is a positively or negatively charged atom or group or atom. For Ex:Sodium ion,Magnesium ion,magnesium ion,chloride ion,oxide ion etc. 1)Cation:A positively charged ion is known as cation.A cation is formed by loss of one or more electrons by an atom. A cation is formed by removal of electrons from an atom therefore a cation contains less electrons than normal atom. Due to more protons than electrons,a cation has positive charge on it. All the metal atoms can lose electrons easily,so all the metal elements form cations. a)If an atom loses 1 electron,then the cation formed has 1 unit of positive charge. b)If an atom loses 2 electron,then the cation formed has 2 unit of positive charge. c)If an atom loses 3 electron,then the cation formed has 3 unit of positive charge. For Ex:Sodium ion,magnesium ion,aluminium ion etc. 2)Anion:A negatively charged ion is known as anion.An anion is formed by the gain of one or more electrons by an atom. An anion is formed by the gain of one or more electrons by an atom. since an anion is formed by the addition of electron to an atom,therefore,an anion contains more electrons than normal. Due to more electrons than protons,an anion has a negative charge in it. a)If an atom gains 1 electron,then the anion formed has 1 unit of negative charge. b)If an atom gains 2 electrons,then the anion formed has 2 units of negative charge. c)If an atom gains 3 electron,then the anion formed has 3 units of negative charge. Those ions which are formed from single atoms are called simple ions.They are called as monoatomic ions. Those ions which are formed from groups of joined atoms are called as polyatomic ions. For Ex:Ammonium ion,Carbonate ion,sulphate ion etc. 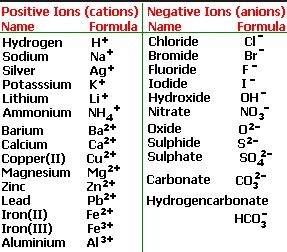 The compounds which are made up of ions are called as ionic compounds. In an ionic compound,the positively charged ion(cation) and negatively charged ion(anion) are held together by the strong electrostatic forces of attraction. The forces which hold them together are called as ionic bonds or electrovalent bonds. For Ex:Sodium Chloride(NaCl) is an ionic compound made up of equal number of positively charged sodium ion and negatively charged chloride ion. Aluminium chloride,calcium chloride,potassium nitrate,calcium carbonate etc. An ionic compound is made up of extremely large number of positively charged ions and negatively charged ions joined together. The simple combination of ions that produces an electrically neutral unit,is called a formula unit of the ionic compound. The formula mass of an ionic compound is the relative mass of its formula unit as compared with the mass of a carbon-12 atom taken as 12 units. Formula mass is the sum of atomic masses of the atoms or ions represented by its formula.